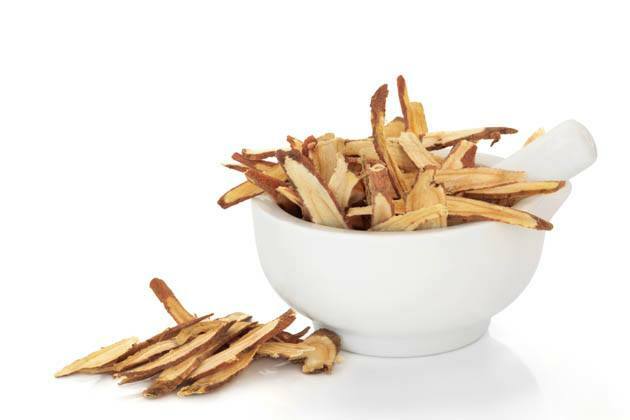 Licorice root is a very popular herb in Chinese medicine and has been used for years to treat many conditions. Licorice root tea is the best way to use licorice root. 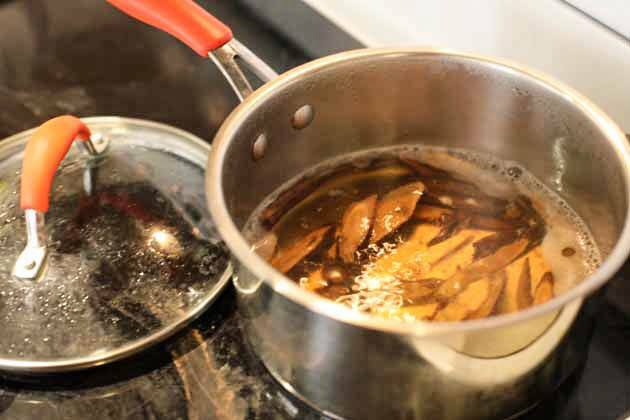 In this post, we will go over the benefits of licorice root, how to prepare licorice root, and how to make licorice root tea. 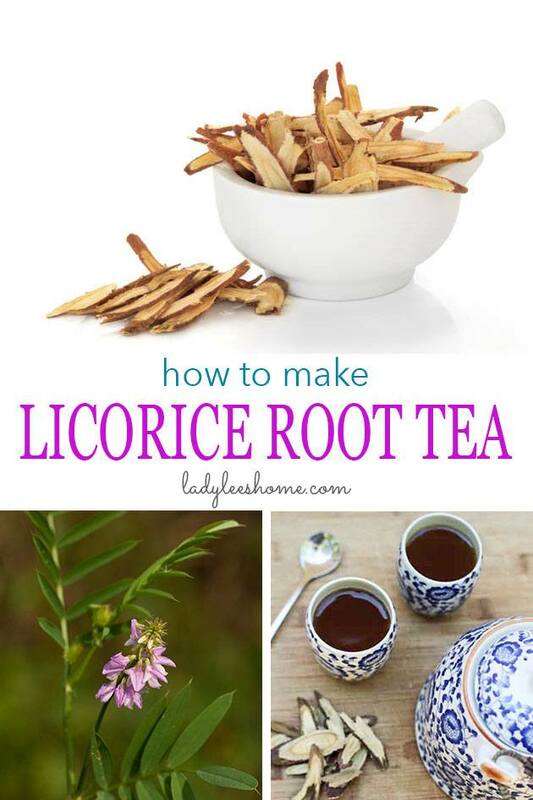 You’ll also find a handy licorice root tea recipe printable at the end of this post. A few years ago, I had an awful cough that wouldn’t go away. The kind that doesn’t let you sleep at night. I was looking for a natural, herbal remedy to help me heal my throat, and came across a licorice root tea recipe for sore throat and cough. I had never heard of licorice root before so I thought I’d give it a try. I ordered a bag of licorice root slices and made the tea. It only took a few cups of tea before the cough was completely gone. Since then, I make sure to always have licorice root in my herb cabinet. I’ve learned that this wonderful root has many more benefits and I will list those in this post. Licorice root tea is made from the root of the medicinal herb licorice (also known as liquorice). 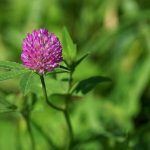 It is the most used herb in Chinese medicine and has been used in Europe since prehistoric times (read more HERE). It has been used for centuries to flavor foods, to sweeten drinks, to flavor tobacco, as a foaming agent in beers, and to harmonize contrasting herbs. The Glycyrrhiza glabra plant (licorice) is a perennial that is native to southern Europe and Asia. 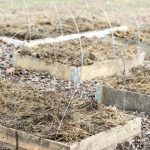 The root is harvested and often boiled. In the boiling process, the sweetener glycyrrhizin is removed to form licorice extract which is significantly sweeter than sugar. 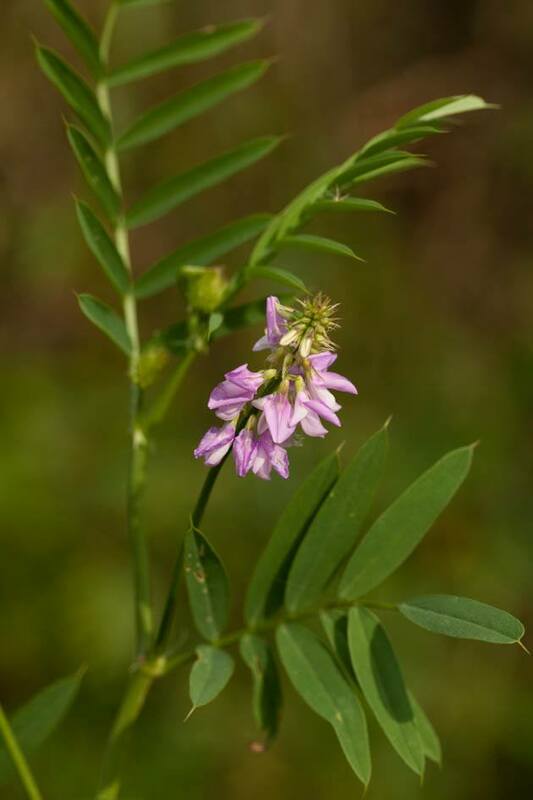 Settles stomach problems – licorice root will help relieve stomach pain, treat ulcer and heartburn, and will jump-start the digestive tract in case of constipation. Relieve stress and fatigue – licorice can help regulate cortisol which is the stress hormone. As a result, it gives our adrenal glands a break and prevents adrenal fatigue. Supports a healthy respiratory system – licorice root is anti-inflammatory and will help loosen mucus in the lungs and clear clogged nasal passages. it is very effective in treating cough. (Read more about licorice root anti-inflammatory properties HERE). Relieve muscle pain – licorice is antispasmodic and will help relieve cramping in the muscles. Strengthen the immune system – licorice is both antibacterial and antiviral. It will support and strengthen your immune system making your body stronger against colds and the flu. Licorice is also emerging as a potential treatment and prevention for diseases like hepatitis C, HIV, and influenza. (Read more HERE). Treats tooth decay and prevents cavities – chemical compounds in licorice root help prevent bacteria in oral cavities that cause the formation of plaque and acid which leads to tooth decay. Chewing on licorice root will not only help you keep your teeth healthy but also keep your breath fresh and remove bad odors. (Read more HERE). Improves hair and skin health – licorice root contains elements like choline, phytoestrogens, potassium, phosphorus, amines, essential oils, protein, vitamin B, and flavonoids. Those will promote a healthy scalp, hair, and skin. Licorice root is effective in treating dandruff, preventing hair loss, repairing skin damage, and curing eczema and skin rashes. Reduces PMS, hot flashes, and treats yeast infection – due to its anti-inflammatory and antispasmodic properties licorice can help with PMS. Licorice can help regulate hormones and help with menopause issues like hot flashes and mood swings. Licorice root can also fight and cure yeast infection. 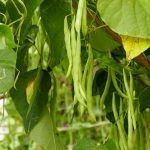 (Read more about licorice root and hormones HERE). Helps with weight loss and good for diabetics – licorice extract is a natural sweetener that is even sweeter than sugar. If you are diabetic, consider using it to replace sugar in food and drinks. Studies suggest that regular drinking of licorice tea can significantly help reduce body fat mass due to the stomach acid controlling properties of licorice. (Read more about the anti-diabetic effect of glycyrrhizin HERE). Support mental health – licorice contains a compound known as carbenoxolone. This compound inhibits an enzyme that regulates stress hormones in the brain that has been associated with mental decline. So you can see we are talking about a super root here. There are more than enough reasons to add it to your diet. The best way to do that is to make licorice tea. 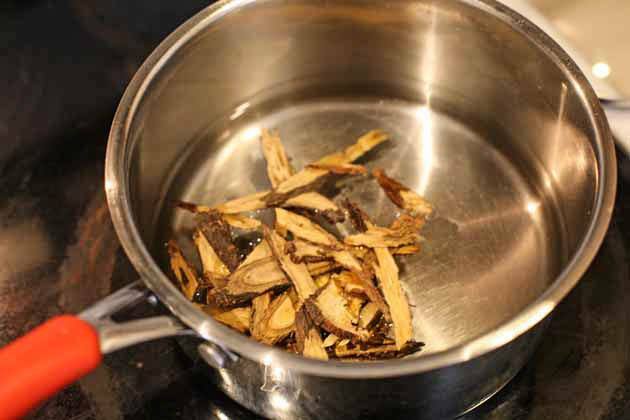 To a pot, add 0.5 oz (=one tablespoon) licorice root for every one cup of water. If you buy the licorice root slices as I use here, it’s easier to weight it since it doesn’t exactly fit in a teaspoon. If you buy the chopped root, it’s easier to add it by the tablespoons. 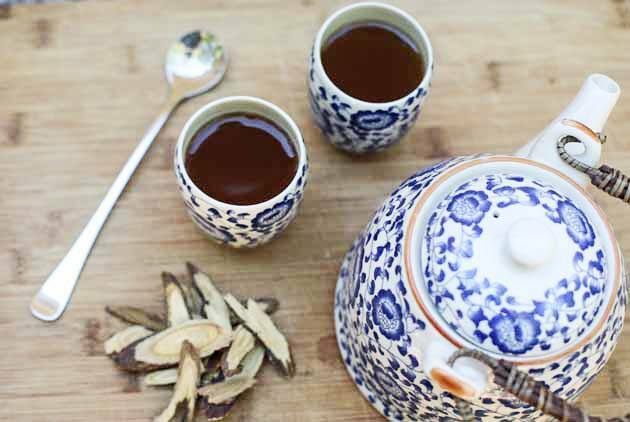 If you are making the tea to treat a sore throat or a cough, also add a stick of cinnamon and a couple of slices of ginger. There is no need to add any sweetener! Licorice root is very sweet. Bring to a boil, then lower the temperature and let it simmer for 10 minutes. Turn the heat off and let the tea rest for 5 minutes. Next, pour your tea through a strainer into a teapot or straight into a cup and enjoy! It is advised that young children (under 50lb), pregnant women, and nursing women do not use licorice in any form. Licorice might increase the risk of miscarriage some say, but there is no research to back this up. Kids that weight more than 50lb can drink 1/3 cup of licorice tea to relieve sore throat and cough up to three times a day for a couple of days. There are no specific instructions for adults. Just don’t overdo it because too much glycyrrhizin can cause serious side effects like headaches, fatigue, and high blood pressure. If used in moderation regularly, licorice tea can play a big role in keeping your body healthy and strong. We increase the amount we drink right away if we feel that we are getting sick or if someone wakes up with a sore throat (up to three cups a day). Then, once we feel better again, we go back to two or three cups a week. I am not a doctor, but I had and still have great experiences with licorice tea. It has been a regular herb in my herb cabinet for the past couple of years. I hope it will help you too. 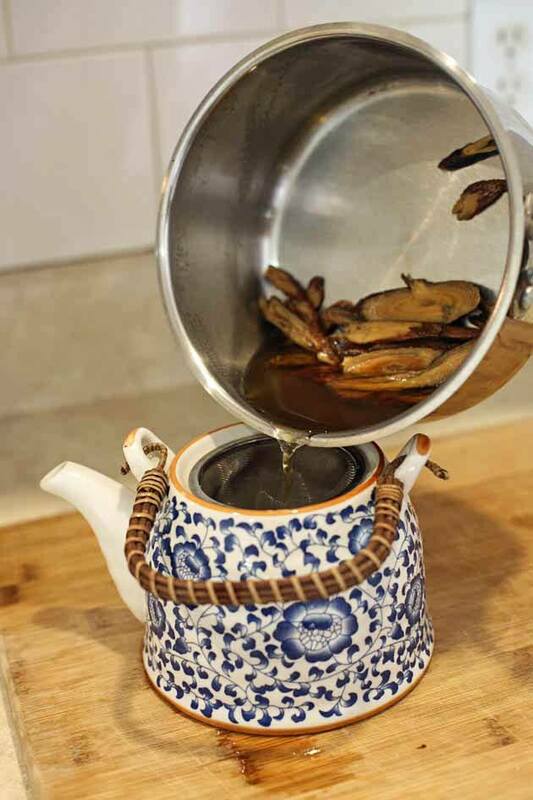 Licorice root tea can support our health naturally in many ways, one way is as a remedy for cough. Add all the ingredients to a small pot. Lower the heat and simmer for 10 minutes. Remove from heat and strain right into tea cups or a tea pot. Sip slowly and let the tea heal your throat! How interesting. I have been growing herbs, but licorice is not one of them. It was interesting that it is used as a sweetener. I guess that makes sense as it is known as a candy. However, I am sure the pure form is better for you. 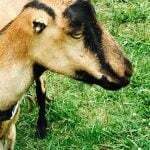 If you chew on the root you’ll taste right away how sweet it is. Also, I don’t add honey or sugar to the tea. It’s sweet enough. Here in the Pacific Northwest we have Licorice Fern, and the roots are used for a tea also but it is obvious these two plants are completely different. I have been searching high and low for more information on our Licorice Fern root for it’s medicinal properties and I bet many of the articles I have read are about the plant you describe. If you have any other information I would love to read more. It seems like the licorice plant that I am talking about in this post and the fern you are talking about are used in a very similar way. The fern is not commonly used in modern herbalism and my guess is that this is because it’s harder to grow commercially. I read that native Americans used it the same way as the root in this post. Either by boiling it and making tea or chewing. The two plants are both a part of the genus Glycyrrhiza, so maybe not completely different. I think you should really consider yourself lucky to have access to this fern! It is one of the many plants we enjoy using and foraging for, but it takes so very little of the fern root to make a tea, we only gather more when we are running low. I is one of my favorites on a cold winter day. This tea really works! I have enjoyed this pleasant herbal tea at home! Thank you for sharing Licorice Tea: What is it, How to Make it, and Why drink it at the Healthy Happy Green and Natural Party Blog Hop! Your photo tutorial is awesome and easy to follow. I am so delighted that you are partying with us. I’m pinning and sharing. You can also add slippery elm with the licorice root tea! Will definitely try that. Thanks. Where do I buy the root? 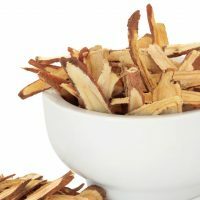 I have pcos, can I take licorice tea daily ? Thanks for the valuable information. I would likee to share more information. Licorice root herbal tea prevents hair loss, helps in removing dandruff, handles menstrual pain, helps in detox and weight loss, treats cold and flu, helps in curing sunburns and sunstrokes, cures mental illness and arthritis. I found an interesting and healthy recipe now.